Inactive Ingredients: Inactive Ingredients: Dicalcium Phosphate Dihydrate, Water, Glycerin, Sodium Lauryl Sulfate, Cellulose Gum, Flavor, Tetrasodium Pyrophosphate, Sodium Saccharin. Ingredients: Active Ingredient - Purpose:Sodium Monofluorophosphate 0.76% (0.15% w/v Fluoride Ion - Ant cavity.Inactive Ingredients: Dicalcium Phosphate Dihydrate, Water, Glycerin, Sodium Lauryl Sulfate, Cellulose Gum, Flavor, Tetrasodium Pyrophosphate, Sodium Saccharin. Active Ingredients: Active Ingredient: Sodium Monofluorophosphate (0.76% (0.15% w/v Fluoride Ion)). Purpose: Anticavity. Instructions: Adults and children 2 years of age and older: Brush teeth thoroughly, preferably after each meal or at least twice a day, or as directed by a dentist or physician. Children 2 to 6 years: Use only a pea sized amount and supervise child's brushing and rising (to minimize swallowing). Children under 2 years: Ask a dentist or physician. No only is buying the three at a time cheaper, but it lasts a lot longer and you don't have to keep running out and buying more toothpaste. And, although I don't know if it really fights cavities, it tastes good. Been using it almost my whole life! I am 48 years old and have been using this toothpaste since the 1970's. Briefly I used the gel formula in the early 80's but returned to my old standby. Anytime I tried another toothpaste (like at a boyfriend's house) I gagged. Dentists have recommended other formulas (tarter control, sensitive) but I know not to change what works for me. If Colgate ever discontinued this I would cry. I have heard dentists recommend that just the basic, regular toothpaste is all that is really needed. 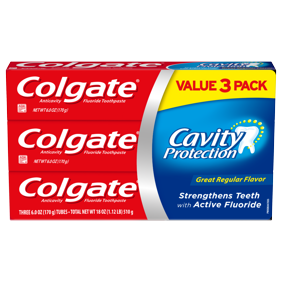 We have been Colgate users for many years and the multi pack at a low price is very cost effective! Love colgate. It really helps to clean the fangs. And, in multi-packs, the price discount is good, and you don't have to buy toothpase very often. Great product, and Walmart is good to let me order it online, and ship it to my house for free (no gas cost to get to the store, and no waiting in line with a small purchase).